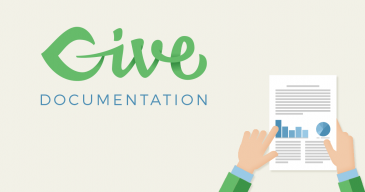 Add-ons allow you to extend the power and functionality of Give. This section goes into detail on each add-on available through our site. You’ll learn what each setting and configuration is for, and even additional developer actions and filters for implementing these powerful tools. Add-ons are WordPress plugins and can be installed like any other WordPress plugin. Because these are purchased rather than hosted on the WordPress repository, you’ll need to first download and then upload + activate them. You can always access your Add-ons by visiting the Downloads section within My Account. Once there, if you click on the link next to the download you wish to install your browser will download the plugin zip file. Now that you have the appropriate plugin file downloaded it’s time to now install and activate it on your WordPress website. There are two ways to upload premium plugins: (1) through the WordPress “Add New” plugin screen; or (2) with an FTP client like FileZilla. WPBeginner has an excellent tutorial on installing plugins. The first part covers installing plugins from the WordPress repository. Skip to the part about uploading plugins through your WordPress admin. WPBeginner provides quality tips, tricks, hacks, and other WordPress resources that teaches WordPress beginners to improve their sites. After you purchase a Give Add-on, you’ll be sent an email with a link to download a ZIP file. Alternatively, you can also log into your account and go to your Purchase History and download the ZIP file. Save it somewhere on your local computer in a place that is easy for you to find for future reference. NOTE: If you’ve purchased a bundle, individual zip files for each add-on in the bundle are emailed to you and also available in your “My Account” page. The bundle Add-ons should be added one at a time using the instructions below. Now that you have it downloaded, you’ll need to install it on your website. REMEMBER: Give Add-ons do not work at all without the free Give plugin. Make sure you have the Core Plugin downloaded and activated first. A pop-up will appear allowing you to browse the files on your local computer. Go to the ZIP file that you previously downloaded, and choose that. Now the “Add Plugins” screen will show the “Install Now” button as active and ready. Click that now. You’ll see WordPress list the progress of the install, and then you’ll see a success message and two links. One will say “Activate Plugin”. Click that and you’re done! The Team at WordImpress uses FileZilla for all our FTP needs. Highly recommended. Now that your Add-on is activated and configured, you should activate your License Key.Currently you most likely see an alert in your admin that says that your Give Add-on license is “Unlicensed”. This simply means you have not yet entered your license key into the Give Add-on Settings properly. Your License Key is not required for the Add-on to function, but as long as your license is active, you’ll have access to our Premium Support Forum and you’ll get automatic updates in your WordPress site whenever we push important updates out to your Add-on. This is particularly important for Payment Gateways as there can be necessary security upgrades, or changes to the Payment Gateway API that require an update. When you purchased your Add-on you should have received a confirmation email that had both a download link and your license key. Save that license key somewhere safe in case you need it again in the future. To activate your license, copy that license key from your email, and login to your site. Next, navigate to “Donations > Settings” and click on the “Licenses” tab. 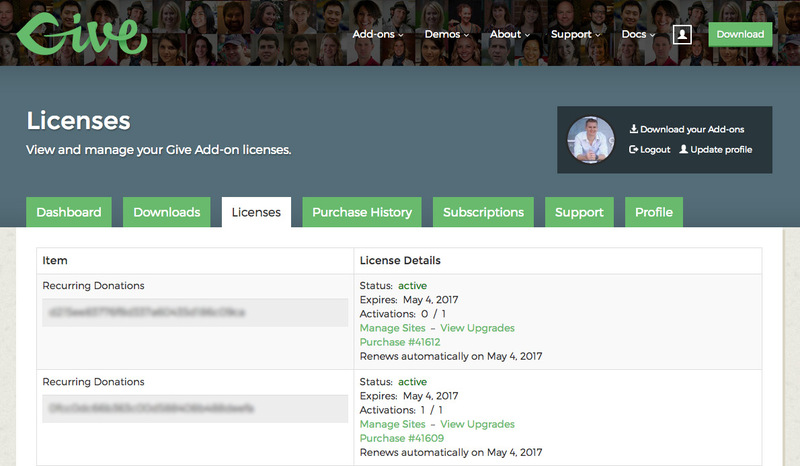 There you will see a list of your Premium Give-Add-ons and a field to enter the license key. When you’ve entered the correct key and clicked “Save Settings” you’ll see a green checkmark in the license key field indicating that the license has been successfully activated. If you misplaced the original email, you can always retrieve your license by logging into GiveWP.com and clicking on the “Account” menu item, then clicking on “My Account”. There you’ll see several tabs available to you. The first one is called “Purchases”. There you will see a list of all your purchases with GiveWP.com. On the far right you’ll see a link called “View Licenses”. Click that and you’ll be able to copy all of your premium Add-on licenses.